While I don't know of any original homesteaders cabins left in the valley, this image from the Lois Peironnet Cloud album gives a glimpse back to that era. 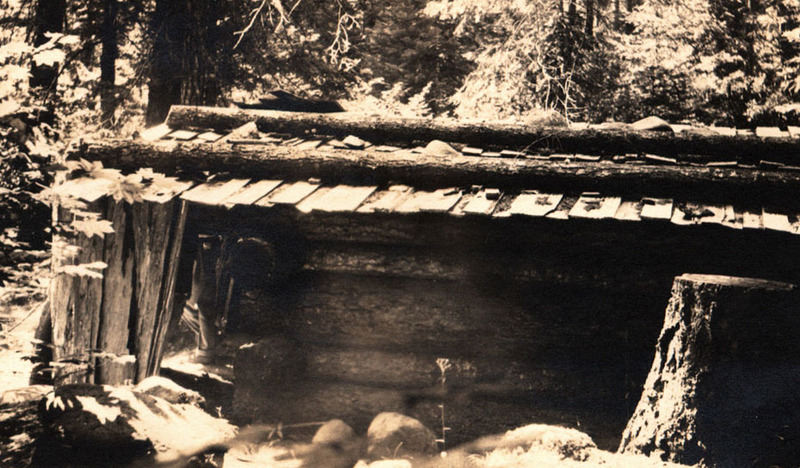 When she came upon this cabin in 1913 it was already an historic relic. From its context in her album I believe it was located on or near Roy Routson's homestead, where Miss Peironnet apparently spent some time escaping the summer heat in 1913. Routson's homestead is now Routson Park (owned by Hood River County). I wish we had more information about this homestead, but her photo album doesn't offer any more clues. This looks typical of the first homes, especially bachelor homes, all over the U.S. They leaked when it rained hard. They leaked when the snow melted and they were a packrat haven. Even when you were living in them. But, they were a welcome shelter from the elements. I'm curious if there is a stove pipe somewhere. Is that somebody standing in the doorway? Looks like pantlegs with a rolled up cuff and boots at the edge of the patch of sunlight. Fire last week came near destroying the ancient bungalow occupied by Flint Bradford at Mount Hood. The blaze started in the roof while Flint was away from home and had it not been for the timely discovery by Mrs. Bradford this classic piece of architecture would probably have been consumed. It was erected, it is said in 1864 by Joseph Diver and antedates all bungalows new and old in Hood River county. In fact, the exact style it was originated from has never been discovered. It combines all the classic features of the first home of Abraham Lincoln with those of the hero of Tippecanoe. The loss of this mother and father of modern bungalow architecture at Hood River would have been irreparable and caused Flint such a shock that he immediately borrowed $4 on his dog with which to place some insurance. P.E. Bradford has ten acres partially cleared. All old timers know Flint Bradford. He is the son of an Oregon pioneer, P.F. Bradford, Jr., and was born in Portland during the time of the Indian war of 1856 while his mother was a refugee from the dangers of an Indian raid at the Cascades.